News, notes, and commentary before, during, and after Red Sox games throughout the 2014 season. FINAL: @RedSox 7, Rays, 4. Game over. #RedSox 7, #Rays 4. WP Lackey. LP Gomes. Save Koji, his 6th, on 3 pitches. KOJI-TIME! We go to @TeamUehara for the final out. 2 outs in 9th, runner on 2B, and Koji entering. #RedSox 7, #Rays 4. Zobrist due up. Escobar single/E-6, and 2R score. #RedSox 7, #Rays 4. 1 out in 9th. The Red Sox have scored at least 7 runs in 3 of the last 4 games. They scored 7+ runs once in the 1st 23 games of 2014 before this stretch. Lackey done: 8IP, 6H, 2R, 1 BB, 5K, 112-74. In line to go 4-2. ERA goes from 4.22 to 3.83. Mujica in for 9th, #RedSox 7, #Rays 2. Everyone in the lineup has been on base tonight. @RedSox have 23 runs in 4 games since entire lineup became available Friday. Ortiz with RBI single in 8th, scores Pedroia. Bogaerts now only member of #RedSox lineup without a hit tonight. Sox lead #Rays 7-2. Singles for @15Lasershow and @ShaneVictorino (his 4th hit of the night) in the bottom of the 8th and we've got 2 on, 1 out for Papi. Victorino 4x4, had 2H entering game,(2x15). Most hits since 4x5, 6/21 at DET. Victorino now 4x4, with SF. What's your guess for first pitch temp? I'm saying (not happily) 38. Meet Brett Miller, our RBI associate found through @Monster — atmlb.com/1hLyQCm — who will be recognized before Wednesday's game! AL Co-Players of the Week: CWS Abreu, SEA Seager. NL Player of the Week: PHI Ruiz. Welcome aboard! MT @mdaniels06 : Starting next week, I’ll be joining the Providence Journal to cover the Patriots. Cutter down Yonge Street. RT @brooksbaseball : That was not where he wanted to throw that pitch. Ouch. The Blue Jays kept one of their hard-hit balls fair, though still not in play. Brett Lawrie ties it at 1. Had it the whole way. Three consecutive 2-out singles have given the #RedSox an early 1-0 lead. Bogaerts needed to be on 3rd there. Bloop single with two outs, should have been there. Singles by Gomes, Bogaerts and JBJ give the #RedSox a 1-0 lead on Dickey and the Jays. Jackie Bradley, Jr. getting RISPy with two outs on a ball badly played by Melky Cabrera in LF. 1-0 Red Sox. 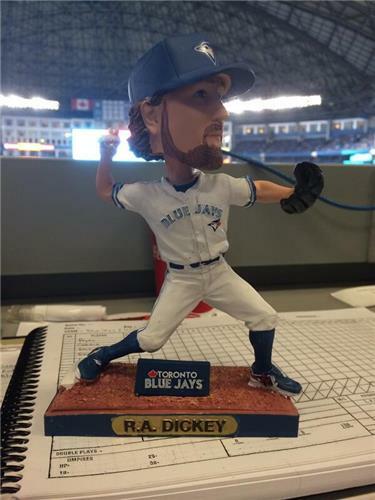 Will Middlebrooks did not agree when I suggested it'd be mean to hit multiple HRs off Dickey on his bobblehead day. Let's play ball in Toronto! @15Lasershow leads off for the #RedSox . R.A. Dickey takes the mound to the Game of Thrones theme. It is Sunday.